Glushko LOx/Kerosene rocket engine. Zenit stage 1. In production. RD-171 used two-plane gimballing versus one-plane gimballing on RD-170 developed in parallel for Energia. First flight 1985. AKA: 11D521. Status: In production. Date: 1976-86. Number: 60 . Thrust: 7,903.00 kN (1,776,665 lbf). Unfuelled mass: 9,500 kg (20,900 lb). Specific impulse: 337 s. Specific impulse sea level: 309 s. Burn time: 150 s. Height: 3.78 m (12.40 ft). Diameter: 4.02 m (13.17 ft). 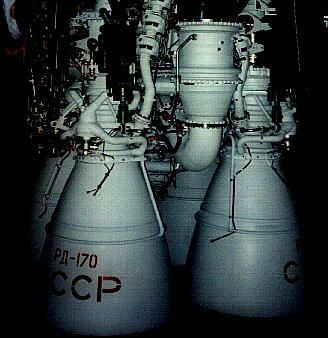 The RD-170 and RD-171 engines consisted of 4 chambers, 1 turbo-pump and 2 gas generators were developed simultaneously, the difference being one-plane gimballing in the RD-170 used in the Energia launch vehicle strap-ons versus two-plane gimballing in the RD-171 used on the first stage of the Zenit launch vehicle. The RD-171 can be gimbaled using bellows to 6 degrees normally but it has reached 8-10 degrees in tests. The chamber conditions are 300 atmosphere pressure and at a 400 degrees C oxygen-rich gas mixture - very dangerous conditions. The RD-170 was very hard to prove and many designers thought it couldn't be done. The first stage strap-ons were recovered under parachutes and returned to Baikonur for study. The engine was designed for 10 reuses but tests showed they could stand up to 20 burns. The 170 MW turbo-pump is equivalent to three nuclear ice breakers. Developed 1973-1985. Figures are per chamber. Engine Cycle: staged combustion. Oxidizer: LOX at 432 kg/s. Fuel: Kerosene at 166.2 kg/s. The engine can be throttled back to 56% of full thrust. Chamber Mass: 480 kg. Burn Time: 140-150 sec. Diameter is per chamber. Chambers: 4. Thrust (sl): 7,550.000 kN (1,697,300 lbf). Thrust (sl): 769,876 kgf. Engine: 9,500 kg (20,900 lb). Chamber Pressure: 245.00 bar. Area Ratio: 36.87. Thrust to Weight Ratio: 84.84. Oxidizer to Fuel Ratio: 2.63. Country: Russia. Propellants: Lox/Kerosene. Stages: Angara Stage 1, Zenit-A. Agency: Glushko bureau. Bibliography: 287, 317, 342, 7503.